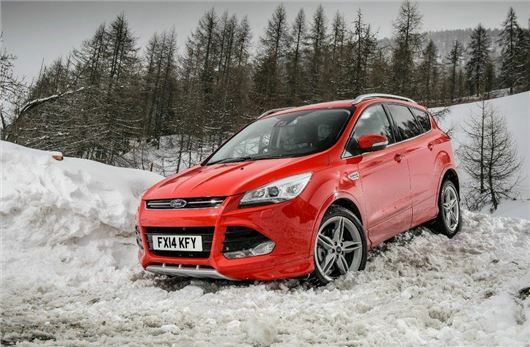 Ford has raised the specification ceiling for the Kuga by adding a new range topping Titanium X Sport trim. Standard equipment includes body styling kit, 19-inch alloy wheels, silver roof rails and rear view camera. Prices for the new trim start at £28,345 and order books are open, with deliveries starting from 17 March. According to Ford, the Titanium X Sport has been launched in response to customer demand, with more than 80 per cent of Kuga customers opting for higher specified models. The new trim will include a number of improvements over the Titanium X, with Sony DAB navigation, rear view camera, active park assist and power folding door mirrors all fitted as standard. Titanium X Sport models also get a new bodykit, with colour coded skirts, spoiler, wheel arches and door claddings. A lower centre silver skid plate and rear diffuser completes the uprated appearance, which can be specified in all of the Kuga’s existing paint schemes. The Titanium X Sport trim adds £2950 on the standard Titanium X model and is available with Ford’s 1.6-litre EcoBoost petrol – 150PS or 180PS – or the 2.0-litre TDCi diesel with 140PS or 163PS.